A few little pieces of rubber or ceramic can save your container garden's life. Pot feet raise your plant containers off of your deck or patio and allow water to drain away without a mess. Whether you live in an area that gets heavy rain or you see the effects when you water heavily, you'll notice that drain holes in your pots often can't handle the flow. Depending on the container design, the drain holes may be blocked when it is sitting on a hard surface. As water builds up, your potting soil may float to the top and overflow onto your deck, making a mess. Waterlogged plants are not happy plants. If the water doesn't drain properly, you will see the effects in your plant health. The plants can look wilted or have yellowing leaves. Not only do you see problems when you have overflows, but you'll also often note the stains left on your hard surface beneath containers that sit directly on it. While some containers are designed, so water flows out of the sides rather than the bottom, you may still see stains where these sit on your hard surface. As the soil and chemicals that drain from your containers are trapped on the surface, it can leave discoloration that is hard to remove. If this had a chance to dry out faster and be washed away, there would be less staining. You need a solution that will raise the pot off the surface. You can solve this problem by using pot feet or risers. You can make them yourself or buy commercially available pot feet. Pot risers: These are small recycled rubber squares that you put underneath your planters. They aren't visible underneath your containers, so they don't clash with any decor. They work like a charm, keeping your pot off whatever surface you have them on, not only helping drainage but also protecting your surface from stains and scratches. They are available in a variety of sizes for small pots to large container gardens weighing a ton or more. Pot Pads by Allsop Home & Garden: These are hard plastic domes with non-skid rubber grips that suction to your pot. That makes them easy to remove. The dome shape means that the points of contact with your hard surface are small. That will result in fewer areas where there might be stains as residues will wash or blow away. The increased airflow under your containers should help keep the plants healthier, reduce the risk of mold, and not set up a place where bugs can live underneath your containers. Decorative Pot Feet: Pot feet also come in decorative styles, from simple to elaborate. Browse garden sites to see ones that strike your fancy. DIY: You can make your own pot feet. You can cut PVC piping cut into rounds. Shop the flea market shot glasses, teacups, or saucers you can turn upside-down and glue to your pots. 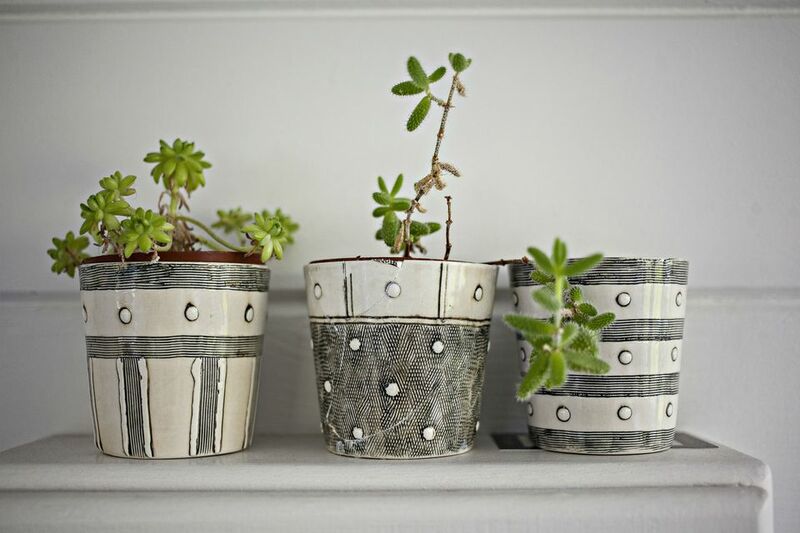 You can also use small terra cotta pots, turned upside down.